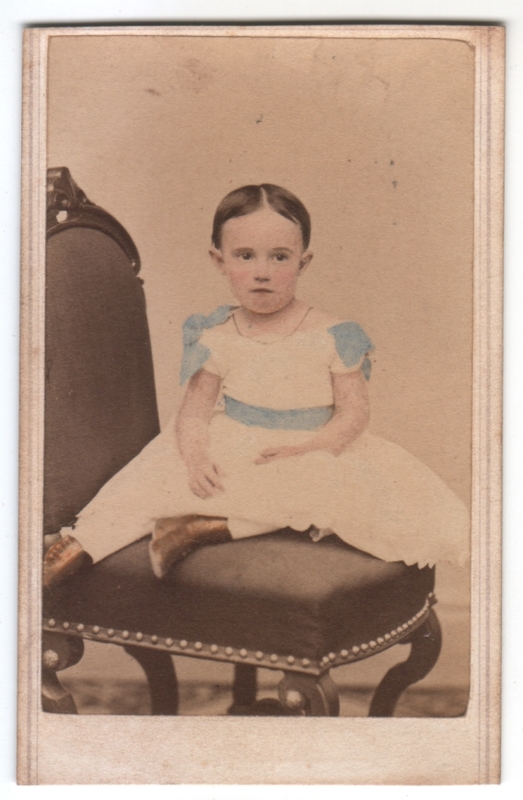 Carte de visite (CDV) measuring approx. 2.5 x 3.75 inches. Anyone who has even glanced at this blog knows I love old black-and-white photos, but yesterday I suddenly felt the need to see a little color, and the same is true today. While I posted a color photo yesterday, today’s is a black-and-white photo that has been tinted. The girl’s boots, the blue trim of her dress, her hair, her eyes, and her skin have all been colored. Interestingly, it was the notes on the back that directed me to examine the photo carefully, since to the naked eye it’s only the blue trim, the boots, and her cheeks that are obviously tinted. It makes me wonder what it would have looked like without enhancement to the hair, eyes and skin. Would she have just faded into the background? Yes, she may have just vanished. Lovely post and commentary, Matt. Sure it’s a girl? Back then both boys and girls wore dresses and boots. There wasn’t a color assigned to gender, and most children were just children until they wore clothes for their gender around age 7. You’re right, clothing could be misleading at that age. Actually, from what other people have commented on other posts, the parted hair is a clue. Girls would have their hair parted in the middle, and boys would have a side part or no part.